Halo Projector Headlights will provide you with a stylish look and performance which the OEM head lamps never could provide. The appealing angel-eye halo rings as parking lights and the optical projector make the light-beam focused and concentrated to give you an awesome, aggressive new look plus safer driving on the road. What Do We Offer at iJDMTOY? 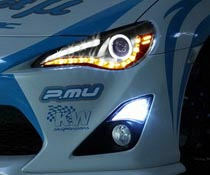 Here at iJDMTOY.com, we offer varieties of custom projector headlights such as Crystal Clear, Platinum Chrome, JDM Black, JDM Altezza, Euro Smoke, and many, many more. 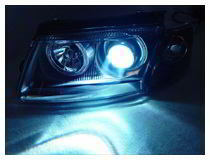 Not only this, every set of headlights can be quickly done with an and easy plug-and-play installation. 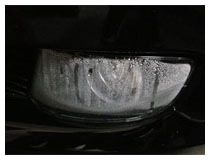 This allows you to show off your enthusiastic halo angel-eyes everyone loves in just a couple minutes. Don't put off the modern makeover every model embraces. Upgrade with a pair of halo projector head lamps today! 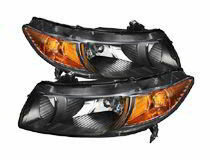 Euro Headlights are a style of headlight housing that is very popular to replace the OEM headlamp housings. Most factory OEM headlight assemblies, especially the ones on some older models, are really simple and plain. On the other hand, the Euro style headlights will look much better because the specially designed black or chrome base with the reflectors and bulbs are setup in a more stylish design. Some of the customization options available for vehicles are for safety reasons, while others are a great way to make your car look better. In some cases, they overlap, and you get a new look, with added safety features. 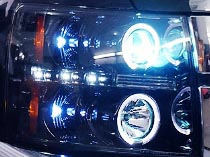 Our halo projector headlights are a prime example where you combine aesthetics and safety. In addition to their stylish look, the performance is better than the standard ones, giving you brighter lights that last longer. We offer a variety of halo projector headlights for many makes and models including Acura, Chevy, Infiniti, MINI, Porsche, and more. All of our options are custom, meaning you can choose from more than just your basic white. Instead, you can choose from a variety of colors, housings, and can choose smoke or non-smoke options, depending on the make and model of your vehicle. Some customizations can be time-consuming and complicated, but not this one. All of our options offer easy plug and play installation, making it a simple upgrade that anyone can do. No need to envy others on the road who have this sporty feature, instead get ready to answer questions and comments about where you got yours, and how your car looks so great. Vehicles are more than just a means of getting from one place to another, and yours should be treated as such. Give it a modern makeover easily with our halo projector headlights. It’s easy, and we offer guides to help you along the way and make it even easier. 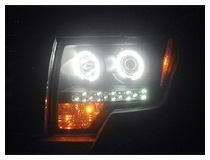 In addition, our options will burn brighter and for longer than the standard options your vehicle came with. Here at iJDMTOY, we are pleased to offer vehicle enthusiasts only the best products on the market. 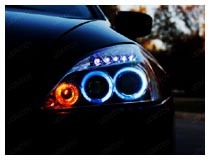 We are your destination for automotive lighting, as we understand what your vehicle means to you. If you need help finding a product to fit your vehicle, please contact our customer service representatives. They will be happy to help, and answer any questions you may have.